Not only do white fillings offer an aesthetic alternative to “silver” (dental amalgam) fillings that's hard to match — they may also allow for a more conservative treatment method that preserves more of the tooth's structure. When you put these advantages together, it's no wonder some dentists say we're moving toward a “post-amalgam” era. 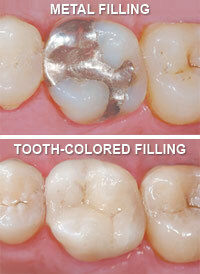 White fillings are made of a blend, or “composite,” of plastic resins and silica fillers. These substances mimic many of the qualities of natural tooth structure, such as wear-resistance and translucency. Dental composites also help strengthen teeth. Whatever the situation, the best way to determine whether white fillings are right for you is to come in and consult with us. We can explain the appropriate options and help you select the best way to proceed with treatment. Either way, you'll be able to achieve — and keep — a healthy-looking smile. Interesting in a white filling? Call (734) 994-3700 today to schedule an appointment at Walcott Dental in Ann Arbor, MI.